I had a student last semester who was a prolific doodler. She was one of the few doodlers that actually doodled about math. This was one of my favorites. I just got done giving test 3 in most of my classes. This is my favorite test doodle from this round. 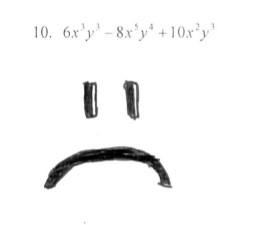 Instead of just leaving the problem blank, I got the paper version of an emoticon. I also feel vaguely like plugging something in. Are you feeling that, or is it just me? I like palindromes, too, as long as they are A palindromes or B palindromes.